If you’re anything like me, you probably understand how hard it is to stay under budget every week on groceries. The clearance racks are the bane of your existence, just begging you to spend money you don’t have. The kids ask for every box of cereal in sight, and you’re so hungry you grab a bag of chips to much on during your trip home. Every little thing adds up, and when you’re on a budget, you can’t afford these little purchases every trip! 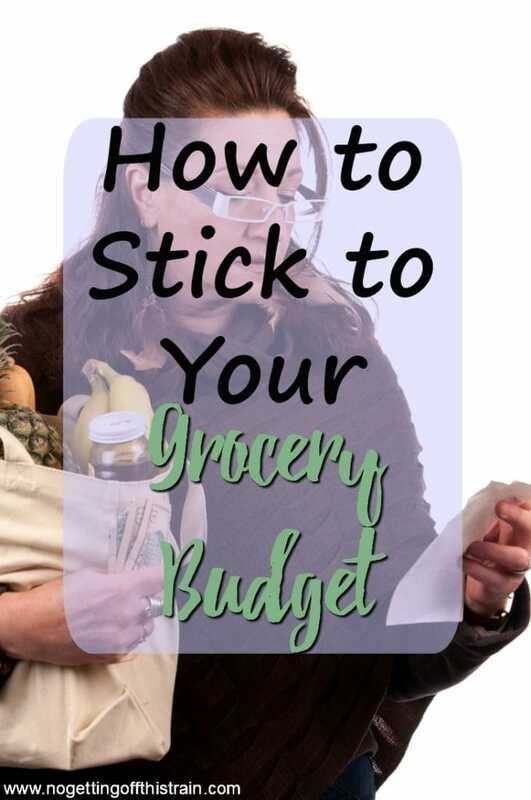 Follow these tips on how to stick to your grocery budget, and control your weekly spending. This is probably the best way for you to keep on track! Keep an envelope at home with your typical monthly grocery money, and only get out what you’ll spend that week. That way you’re not tempted to spend more than you have! If you find yourself running to the store three times a week, you should probably rethink your strategy. The more often you go to the store, the more likely you are to buy something you didn’t plan to! Try to shop only once a week and get everything you need all in one trip. Have you ever went shopping while hungry? I have, and I’ve had disastrous results! EVERYTHING looks amazing and delicious when I’m hungry, and I’m much more likely to put things in my cart that aren’t on my grocery list. Cookies, I’m looking at you! 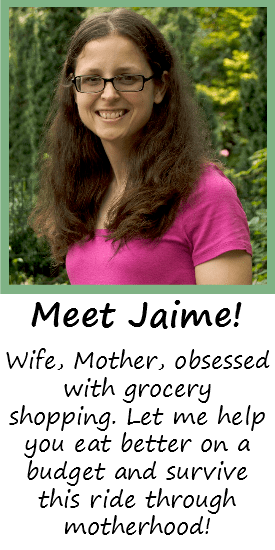 I touched on this on a previous post about how to save $60 a month on groceries, but it definitely bears repeating. Can you taste a difference between the different cans of corn? It’s okay to be loyal to some name brands; I can’t buy any kind of macaroni and cheese except Kraft! If you’re not picky though, try a store brand to see how you like it. You save so much money doing this! Every Sunday I look through the ads to see what’s cheapest. Don’t do your shopping until you see the ad! Chances are, you might see something you were going to buy anyway, perhaps even at a different store. I love when I see that the produce I wanted went on major sale at another store like Aldi! This is, in my opinion, tied with #1 as the most important way to stick to your budget. I never do any shopping without making a list first! In addition to just adding the items I need to the list, I also include the price of each item. I don’t know the price of EVERYTHING; I do make guesses for some things and am sometimes horribly wrong, either good or bad. But I’ve got a pretty good idea of how much things cost, and that just comes with time and practice. If it helps, record the prices of everything you buy so that next time you have a good idea of what everything costs! New to list making and meal planning? Check out my tips on meal planning for beginners! The fewer people that go on the shopping trip, the fewer temptations there are! I know that when John and Allison come with me, John sees things that I walk right past. “Oh look, this is on sale this week!” And sometimes I would give in because hey, it’s only a dollar! But then we end up over budget. And kids are even worse, with the cookies and the cartoon characters on boxes. So leave the kids at home with dad, if possible, and focus solely on shopping! It may take practice, and you won’t be perfect every week. There are times even now when I make mistakes and am over budget by a few dollars, and will have to make it up the next week. 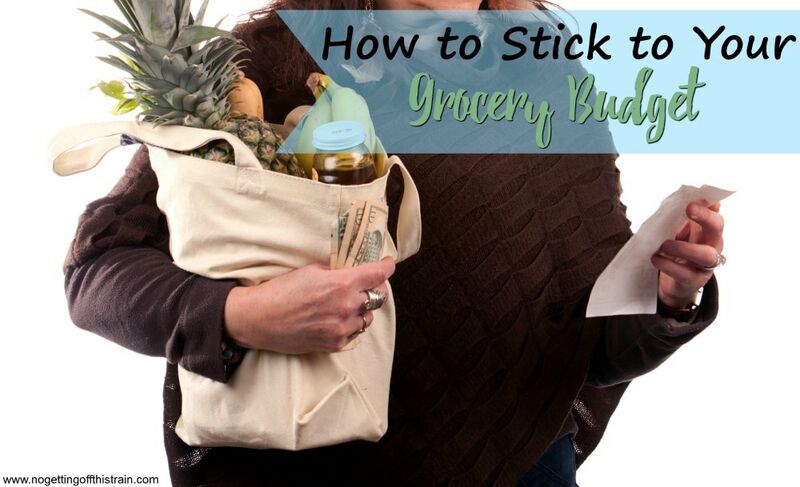 Just stay with it, and in time you’ll be a pro at sticking to your grocery budget! Can you relate to any of these? How do YOU stick to your grocery budget? Share with us below! Great tips! I am the very worst for this! I recently downloaded a budget app and have a section for groceries. This has really helped to keep me on track!! Awesome! We use GoodBudget to let us know how much money is available for groceries; it really helps, especially if I happened to be over budget the previous week. These are great tips. My biggest problem is #3. I’m hungry, so everything that looks good ends up in the cart. My aunt advised to carry around mini cans of v-8 and eat a stick of cheese to curb hunger before shopping. Great tips! Especially the eat before you go shopping. I sometimes will find myself in the store so hungry because I haven’t eaten in hours or I forgot a meal (hahaha- funny how that happens when you’re a mom!) and I will buy so much more than I normally would. I’ve been so guilty of this too! I try to make sure I eat something before I go, but that doesn’t always happen. Definitely! I’m very much a “Get your stuff and get out” person, so shopping alone helps! Grocery delivery is so helpful! Yeah, Allison’s still a little small to ask for things. =) I’m dreading when she gets older though, haha. Great tips!! I too have saving money on groceries down to a science. I’m on snap (desperately trying to get off), which makes saving money, for us, the difference of running out of food before the end of the month or not. Thanks so much for sharing! You have to do what you have to do to put food on the table! =) That’s what it’s there for! I’m glad you’re budgeting to get the most out of it! These are some great tips! I have a really hard time sticking to a list. It seems like I always go over budget with those little trips that we make during the week for the things we forgot to get during our main weekly trip. I’m still guilty of doing that! I like to think I’m prepared, but then I find I forget a couple things. These are fabulous tips. although 7 isn’t an option, since I’m a single parent. Hiring a babysitter would DEFINITELY be more expensive than the odd extra my kids might convince me to pick up!